1 August 2008. We made a nightwalk in the evening through the damp forest of Ranomafana National Park. My travel partner could not join us due to night blindsness. Strong torches, flashes or my ring lamp for my macro lens were not allowed. Only weak torches. The mammals up there have delicate eyes. Up the hill we encountered several animals. Two groups with guides walked through each other. 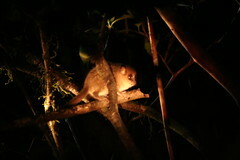 And there we saw this Brown Mouse Lemur. I just had the time to make a quick photo. I could not pass the crowd, so I quickly used my 300 mm lens and used the torch light of my bystanders. These mouse lemurs are very small. And very swift. He just sat there for a mere second and it was off. I luckily had a steady shot and managed to take 2 photos.